Make your drum really speak. This drum derives its name from its versatility and ability to change pitch and mimic human speech. 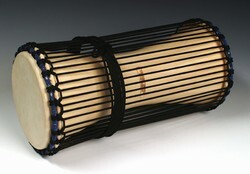 The waist of the drum is held between the player's arm and ribs, so that when squeezed the tension on the heads change, and this changes the pitch. When squeezed it produces a higher note than when it's in its relaxed state. The pitch of the talking drum can be changed during a single beat, producing a warbling note. Played with a stick or your hands, you'll really enjoy the variety of sounds that emanate from this drum.